It has been a great year for our yarns so far with many new designs. 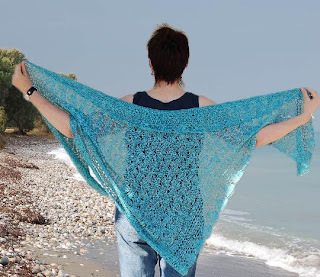 The absolutely amazing Oceans Edge Silk Shawl by Jocre Arts uses one skein of our Pure Silk yarn and attracted the most interest at Stitches East last month. The Oceans Edge shawl measures 78" x 38" and is shown in our Friars Bay colorway. A luxurious triangular shawl showing the pull of the soft waves washing over the rippled sand at the ocean’s edge. 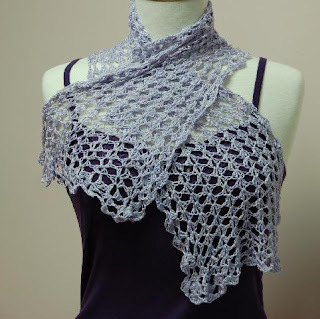 This spectacular design is both breathtaking and fun to knit! For the crocheter we have added two new crochet designs, the Split Shell Silk scarf in our Pure Silk, and two designs using our sock yarns. The Split Shell Scarf is light and airy, while also being warm and very soft! Crocheted in a lacy “Split Shell” design this scarf can be made to any length. 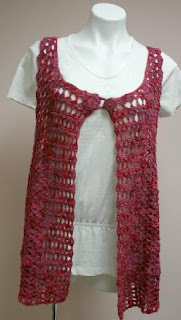 Our Swing vest is an easy crocheted loose fitting swing style vest worked in a lacy "split shell" stitch and features a spiral loop closure. The vest uses three skeins of Ivy Brambles Sockscene and is shown here in our Autumn Flame colorway. Another great design by Janet Magnuson. 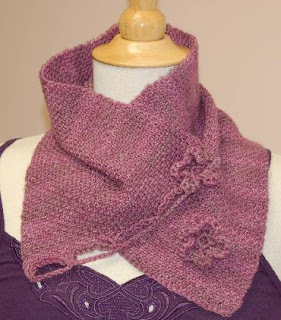 Another great design by Janet Magnuson is the Woven Knit cowl. This adjustable cowl drapes beautifully, and is wonderfully soft and lightweight. The stitch resembles woven fabric and is knit as a simple rectangle. Crochet flowers and loops or I-cord and buttons are added as fasteners.